Whenever I go to Bridport Art’s Centre for a craft fair, I meet a lovely lady called Marcia, she makes buttons, Dorset buttons. Here she is concentrating on the tiny stitches. 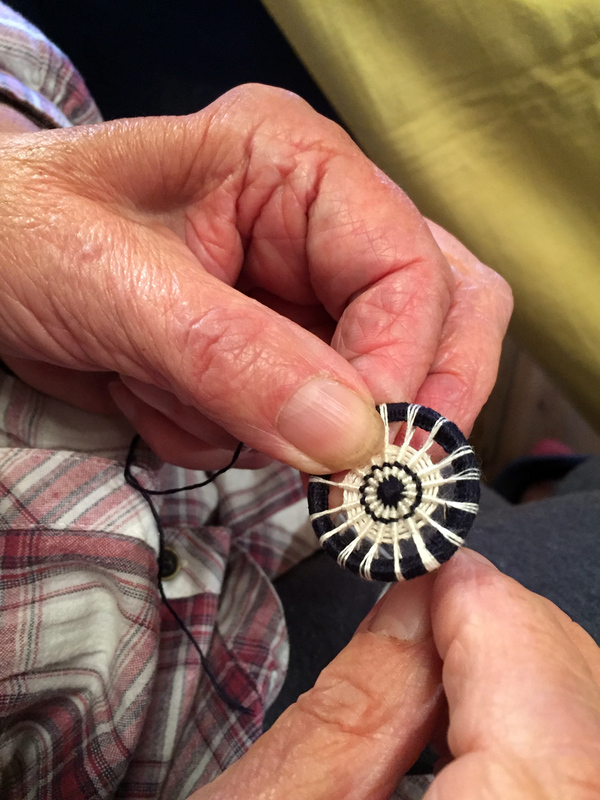 Marcia has been making Dorset buttons for about 8 years, but the craft, known as ‘Buttony’ began in 1669, in a small Shaftesbury workshop, belonging to Abraham Case. The buttons with names like High Tops, and Dorset Knob became the most popular ones in England in the 17th and 18th centuries, spreading to Europe and even to the colonies. I’d be interested to know if anyone in Australia, Canada or the United States have ever come across them, Ruth perhaps? As demand for buttons increased, so the cottage industry grew, with many farm working families finding that they could earn more money, without the drudge of hard labour on the land. In 1851, at the Great Exhibition, the Button making machine was introduced. This struck a fatal blow to the workers, some chose to emigrate to the colonies, those that remained suffered dreadful hardship. The skills of Buttony have not been lost, they are still being skilfully and artfully made by people like Marcia. She makes the Blandford Cartwheel design among others, and has brought their beauty into the 21st century, making them into lovely bracelets, earrings, brooches and cuff-links. She’s also created an ammonite shape alongside the usual round. Here is some of her work. 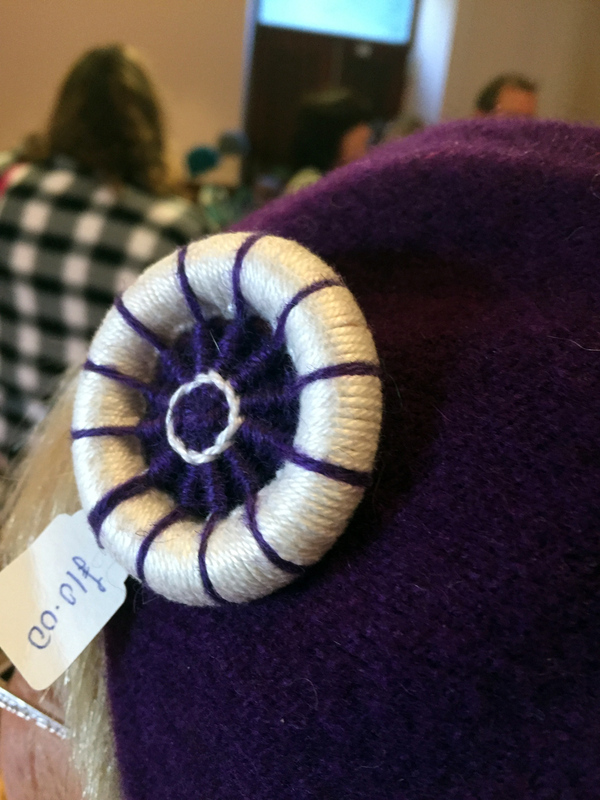 And what could be nicer than a bold cartwheel brooch adorning a beret? Thank you Marcia for your enthusiasm about Buttony and your lovely company! I had no idea there was a name for those buttons. I have a few on old jackets I got at flea markets… Stunning! what a cool craft! and the photo of her fingers and needle with he button is culture rich and speaks volumes. Thank you, I know she will appreciate your comment! Beautiful. You’ve given me some ideas. Perfect, if they come to fruition maybe you’ll take photos! I’ve never heard of Buttony, Gilly, but what lovely things they are. How long does it take her to complete one? Thanks for such a lovely share. 🙂 🙂 Hugs, sweetheart! What a wonderful post, Gilly. I love hearing about old crafts being revived – or maintained. There is a movement in Croatia to prevent the loss of lace-making skills: I spoke to a woman in Dubrovnik who’d learnt from her grandmother, and was demonstrating her skill in the old town. Such arts are so time intensive, and so beautiful. I’d love a button brooch for my beret! Thank you for introducing me to Marcia and buttony, and for a glimpse into the pleasures of your crafty side. I would love to make a button for your beret. If you could tell me what colours you would prefer, and how to send it to you, it would be a pleasure to send one to Croatia!! Dorset buttons and button-making in general are certainly having a resurgence of popularity. Although the buttons are fairly quick and simple to make, they can instantly transform the item they are used upon. How fabulous, and such intricate stitches are used. Amazing artistry. Thanks for sharing. Thanks to Marcia for preserving the traditional hand craft. How very special and beautiful. How informative ad rich with color and her fine efforts! These buttons are unique. I wish I’d been with you, Gilly. Thanks for the mention! I’m sorry I missed it initially but so happy you asked how I liked them. Fuzzy brain from time change? that’s the day of nine hours on the train. Forgive me. The buttons are very cool! I’ve never seen one of these before, but now I’m going to have to be on the lookout for them. I love unique handmade details like this! And how special that there are people continuing the tradition.